"Processing Data Where It Makes Sense: Enabling In-Memory Computation"
Invited paper in Microprocessors and Microsystems (MICPRO), June 2019. Keynote Talk Paper in Proceedings of the 10th International Workshop on Constructive Side-Channel Analysis and Secure Design (COSADE), Darmstadt, Germany, April 2019. "Errors in Flash-Memory-Based Solid-State Drives: Analysis, Mitigation, and Recovery"
Invited Book Chapter in Inside Solid State Drives, 2018. "Enabling the Adoption of Processing-in-Memory: Challenges, Mechanisms, Future Research Directions"
Invited Book Chapter, to appear in 2018. "The RowHammer Problem and Other Issues We May Face as Memory Becomes Denser"
Invited Paper in Proceedings of the Design, Automation, and Test in Europe Conference (DATE), Lausanne, Switzerland, March 2017. "Error Characterization, Mitigation, and Recovery in Flash Memory Based Solid State Drives"
Proceedings of the IEEE, 2017. "Simple Operations in Memory to Reduce Data Movement"
Invited Book Chapter in Advances in Computers, vol. 106, pp. 107-166, 2017. "Research Problems and Opportunities in Memory Systems"
Invited Article in Supercomputing Frontiers and Innovations (SUPERFRI), 2014. 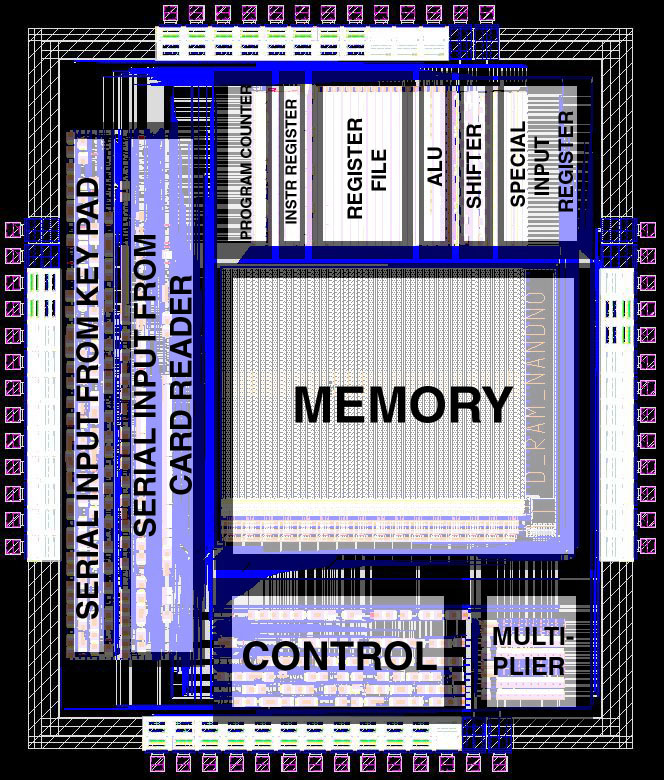 "Memory Scaling: A Systems Architecture Perspective"
IEEE Transactions on Computer-Aided Design of Integrated Circuits and Systems (TCAD) Special Issue on Top Picks in Hardware and Embedded Security, 2019. "CROW: A Low-Overhead Substrate for Improving DRAM Performance and Energy-Efficiency"
Proceedings of the 46th International Symposium on Computer Architecture (ISCA), Phoenix, AZ, USA, June 2019. "CoNDA: Enabling Efficient Near-Data Accelerator Communication by Optimizing Data Movement"
"Understanding and Modeling On-Die Error Correction in Modern DRAM: An Experimental Study Using Real Devices"
Proceedings of the 49th Annual IEEE/IFIP International Conference on Dependable Systems and Networks (DSN), Portland, OR, USA, June 2019. "Demystifying Workload–DRAM Interactions: An Experimental Study"
Proceedings of the ACM International Conference on Measurement and Modeling of Computer Systems (SIGMETRICS), Phoenix, AZ, USA, June 2019. "Panthera: Holistic Memory Management for Big Data Processing over Hybrid Memories"
Proceedings of the ACM SIGPLAN Conference on Programming Language Design and Implementation (PLDI), Phoenix, AZ, USA, June 2019. "NAPEL: Near-Memory Computing Application Performance Prediction via Ensemble Learning"
Proceedings of the 56th Design Automation Conference (DAC), Las Vegas, NV, USA, June 2019. "Enabling Practical Processing in and near Memory for Data-Intensive Computing"
Invited Paper in Proceedings of the 56th Design Automation Conference (DAC), Las Vegas, NV, USA, June 2019. "Project PBerry: FPGA Acceleration for Remote Memory"
Proceedings of the 17th Workshop on Hot Topics in Operating Systems (HOTOS), Bertinoro, Italy, May 2019. "Shouji: A Fast and Efficient Pre-Alignment Filter for Sequence Alignment"
Bioinformatics, [published online, March 28], 2019. "An Analytical Model for Performance and Lifetime Estimation of Hybrid DRAM-NVM Main Memories"
IEEE Transactions on Computers (TC), to appear in 2019. "Analysis and Modeling of Collaborative Execution Strategies for Heterogeneous CPU-FPGA Architectures"
Proceedings of the 10th ACM/SPEC International Conference on Performance Engineering (ICPE), Mumbai, India, April 2019. Proceedings of the 24th International Conference on Architectural Support for Programming Languages and Operating Systems (ASPLOS), Providence, RI, USA, April 2019. "D-RaNGe: Using Commodity DRAM Devices to Generate True Random Numbers with Low Latency and High Throughput"
Proceedings of the 25th International Symposium on High-Performance Computer Architecture (HPCA), Washington, DC, USA, February 2019. "A Scalable Priority-Aware Approach to Managing Data Center Server Power"
"Automatic Generation of Warp-Level Primitives and Atomic Instructions for Fast and Portable Parallel Reduction on GPUs"
Proceedings of the International Symposium on Code Generation and Optimization (CGO), Washington, DC, USA, February 2019. "ITAP: Idle-Time-Aware Power Management for GPU Execution Units"
ACM Transactions on Architecture and Code Optimization (TACO), 2019. "AVPP: Address-first Value-next Predictor with Value Prefetching for Improving the Efficiency of Load Value Prediction"
"‘It’s the memory, stupid’: A conversation with Onur Mutlu"
HiPEAC info 55, HiPEAC Newsletter, October 2018. "A Large Scale Study of Data Center Network Reliability"
Proceedings of the 18th ACM Internet Measurement Conference (IMC), Boston, MA, USA, October/November 2018. "Focus: Querying Large Video Datasets with Low Latency and Low Cost"
Proceedings of the 13th USENIX Symposium on Operating Systems Design and Implementation (OSDI), Carlsbad, CA, USA, October 2018. "Reducing DRAM Latency via Charge-Level-Aware Look-Ahead Partial Restoration"
Proceedings of the 51st International Symposium on Microarchitecture (MICRO), Fukuoka, Japan, October 2018. "Solar-DRAM: Reducing DRAM Access Latency by Exploiting the Variation in Local Bitlines"
Proceedings of the 36th IEEE International Conference on Computer Design (ICCD), Orlando, FL, USA, October 2018. "Efficient Document Analytics on Compressed Data: Method, Challenges, Algorithms, Insights"
Proceedings of the 44th International Conference on Very Large Databases (VLDB), Rio de Janeiro, Brazil, August 2018. ACM SIGOPS Operating Systems Review (OSR), July 2018. "What Your DRAM Power Models Are Not Telling You: Lessons from a Detailed Experimental Study"
Proceedings of the ACM International Conference on Measurement and Modeling of Computer Systems (SIGMETRICS), Irvine, CA, USA, June 2018. "Improving 3D NAND Flash Memory Lifetime by Tolerating Early Retention Loss and Process Variation"
"ECI-Cache: A High-Endurance and Cost-Efficient I/O Caching Scheme for Virtualized Platforms"
"A Case for Richer Cross-layer Abstractions: Bridging the Semantic Gap with Expressive Memory"
Proceedings of the 45th International Symposium on Computer Architecture (ISCA), Los Angeles, CA, USA, June 2018. "The Locality Descriptor: A Holistic Cross-Layer Abstraction to Express Data Locality in GPUs"
"FLIN: Enabling Fairness and Enhancing Performance in Modern NVMe Solid State Drives"
"Nanopore Sequencing Technology and Tools for Genome Assembly: Computational Analysis of the Current State, Bottlenecks and Future Directions"
Briefings in Bioinformatics (BIB), 2018. "VRL-DRAM: Improving DRAM Performance via Variable Refresh Latency"
Proceedings of the 55th Design Automation Conference (DAC), San Francisco, CA, USA, June 2018. "Zwift: A Programming Framework for High Performance Text Analytics on Compressed Data"
Proceedings of the 32nd International Conference on Supercomputing (ICS), Beijing, China, June 2018. MASK: Redesigning the GPU Memory Hierarchy to Support Multi-Application Concurrency"
Proceedings of the 23rd International Conference on Architectural Support for Programming Languages and Operating Systems (ASPLOS), Williamsburg, VA, USA, March 2018. "SPECTR: Formal Supervisory Control and Coordination for Many-core Systems Resource Management"
"MQSim: A Framework for Enabling Realistic Studies of Modern Multi-Queue SSD Devices"
Proceedings of the 16th USENIX Conference on File and Storage Technologies (FAST), Oakland, CA, USA, February 2018. "The DRAM Latency PUF: Quickly Evaluating Physical Unclonable Functions by Exploiting the Latency-Reliability Tradeoff in Modern DRAM Devices"
Proceedings of the 24th International Symposium on High-Performance Computer Architecture (HPCA), Vienna, Austria, February 2018. "HeatWatch: Improving 3D NAND Flash Memory Device Reliability by Exploiting Self-Recovery and Temperature-Awareness"
IEEE Micro (IEEE MICRO), Vol. 38, No. 1, pages 115-117, January/February 2018. "GRIM-Filter: Fast Seed Location Filtering in DNA Read Mapping Using Processing-in-Memory Technologies"
Proceedings of the 16th Asia Pacific Bioinformatics Conference (APBC), Yokohama, Japan, January 2018. Pacific Symposium on Biocomputing (PSB) Poster Session, Hawaii, January 2018. "GateKeeper: A New Hardware Architecture for Accelerating Pre-Alignment in DNA Short Read Mapping"
"Ambit: In-Memory Accelerator for Bulk Bitwise Operations Using Commodity DRAM Technology"
Proceedings of the 50th International Symposium on Microarchitecture (MICRO), Boston, MA, USA, October 2017. "Banshee: Bandwidth-Efficient DRAM Caching via Software/Hardware Cooperation"
"Detecting and Mitigating Data-Dependent DRAM Failures by Exploiting Current Memory Content"
to appear in Proceedings of the IEEE, September 2017. Proceedings of the 19th IEEE Cluster Conference (CLUSTER), Honolulu, Hawaii, USA, September 2017. "Concurrent Data Structures for Near-Memory Computing"
Proceedings of the 29th ACM Symposium on Parallelism in Algorithms and Architectures (SPAA), Washington, DC, USA, July 2017. "MAGNET: Understanding and Improving the Accuracy of Genome Pre-Alignment Filtering"
IPSI Transactions on Internet Research, July 2017. Invited Book Chapter in Advances in Computers, 2017. "The Reach Profiler (REAPER): Enabling the Mitigation of DRAM Retention Failures via Profiling at Aggressive Conditions"
Proceedings of the 44th International Symposium on Computer Architecture (ISCA), Toronto, Canada, June 2017. "Understanding Reduced-Voltage Operation in Modern DRAM Devices: Experimental Characterization, Analysis, and Mechanisms"
Proceedings of the ACM International Conference on Measurement and Modeling of Computer Systems (SIGMETRICS), Urbana-Champaign, IL, USA, June 2017. "Carpool: A Bufferless On-Chip Network Supporting Adaptive Multicast and Hotspot Alleviation"
Proceedings of the International Conference on Supercomputing (ICS), Chicago, IL, USA, June 2017. Bioinformatics, [published online, May 31], 2017. "FPGA-accelerated Dense Linear Machine Learning: A Precision-Convergence Trade-off"
Proceedings of the 25th IEEE International Symposium on Field-Programmable Custom Computing Machines (FCCM), Napa, CA, USA, April-May 2017. "Gaia: Geo-Distributed Machine Learning Approaching LAN Speeds"
Proceedings of the 14th USENIX Symposium on Networked Systems Design and Implementation (NSDI), Boston, MA, USA, March 2017. "Improving the Reliability of Chip-Off Forensic Analysis of NAND Flash Memory Devices"
Proceedings of the Digital Forensics Conference (DFRWS EU), Lake Constance, Germany, March 2017. "SoftMC: A Flexible and Practical Open-Source Infrastructure for Enabling Experimental DRAM Studies"
Proceedings of the 23rd International Symposium on High-Performance Computer Architecture (HPCA), Austin, TX, USA, February 2017. "Vulnerabilities in MLC NAND Flash Memory Programming: Experimental Analysis, Exploits, and Mitigation Techniques"
Proceedings of the 23rd International Symposium on High-Performance Computer Architecture (HPCA) Industrial Session, Austin, TX, USA, February 2017. "Genome Read In-Memory (GRIM) Filter: Fast Location Filtering in DNA Read Mapping Using Emerging Memory Technologies"
Pacific Symposium on Biocomputing (PSB) Poster Session, Hawaii, January 2017. "Nanopore Sequencing Technology and Tools: Computational Analysis of the Current State, Bottlenecks and Future Directions"
Invited Book Chapter in Advances in GPU Research and Practice, Morgan Kaufmann, 2017. "A Case for Memory Content-Based Detection and Mitigation of Data-Dependent Failures in DRAM"
IEEE Computer Architecture Letters (CAL), November 2016. "Yak: A High-Performance Big-Data-Friendly Garbage Collector"
Proceedings of the 12th USENIX Symposium on Operating Systems Design and Implementation (OSDI), Savannah, GA, USA, November 2016. "NVMove: Helping Programmers Move to Byte-Based Persistence"
Proceedings of the 4th Workshop on Interactions of NVM/Flash with Operating Systems and Workloads (INFLOW), Savannah, GA, USA, November 2016. "Enabling Accurate and Practical Online Flash Channel Modeling for Modern MLC NAND Flash Memory"
"Zorua: A Holistic Approach to Resource Virtualization in GPUs"
Proceedings of the 49th International Symposium on Microarchitecture (MICRO), Taipei, Taiwan, October 2016. "Continuous Runahead: Transparent Hardware Acceleration for Memory Intensive Workloads"
One of the six papers nominated for the Best Paper Award by the Program Committee. "Accelerating Pointer Chasing in 3D-Stacked Memory: Challenges, Mechanisms, Evaluation"
Proceedings of the 34th IEEE International Conference on Computer Design (ICCD), Phoenix, AZ, USA, October 2016. "A Model for Application Slowdown Estimation in On-Chip Networks and Its Use for Improving System Fairness and Performance"
"Scheduling Techniques for GPU Architectures with Processing-In-Memory Capabilities"
Proceedings of the 25th International Conference on Parallel Architectures and Compilation Techniques (PACT), Haifa, Israel, September 2016. "µC-States: Fine-grained GPU Datapath Power Management"
"Common Bonds: MIPS, HPS, Two-Level Branch Prediction, and Compressed Code RISC Processor"
IEEE Micro (IEEE MICRO), Vol. 36, No. 4, pages 70-72, July/August 2016. "ThyNVM: Software-Transparent Crash Consistency for Persistent Memory"
Technical talk at Flash Memory Summit 2016 (FMS), Santa Clara, CA, August 2016. "Large-Scale Study of In-the-Field Flash Failures"
Keynote talk at 2016 ACM SIGPLAN International Symposium on Memory Management (ISMM), Santa Barbara, CA, USA, June 2016. "The Row Hammer Problem and Other Issues We May Face as Memory Becomes Denser"
Invited Talk and Paper in Proceedings of the 53rd Design Automation Conference (DAC), Austin, TX, June 2016. [Paper] entitled "Who Is the Major Threat to Tomorrow's Security? You, the Hardware Designer"
"LazyPIM: An Efficient Cache Coherence Mechanism for Processing-in-Memory"
IEEE Computer Architecture Letters (CAL), June 2016. "PARBOR: An Efficient System-Level Technique to Detect Data-Dependent Failures in DRAM"
Proceedings of the 45th Annual IEEE/IFIP International Conference on Dependable Systems and Networks (DSN), Toulouse, France, June 2016. "Transparent Offloading and Mapping (TOM): Enabling Programmer-Transparent Near-Data Processing in GPU Systems"
Proceedings of the 43rd International Symposium on Computer Architecture (ISCA), Seoul, South Korea, June 2016. "Accelerating Dependent Cache Misses with an Enhanced Memory Controller"
"Understanding Latency Variation in Modern DRAM Chips: Experimental Characterization, Analysis, and Optimization"
Proceedings of the ACM International Conference on Measurement and Modeling of Computer Systems (SIGMETRICS), Antibes Juan-Les-Pins, France, June 2016. "Exploiting Core Criticality for Enhanced GPU Performance"
"Who Is the Major Threat to Tomorrow's Security? You, the Hardware Designer"
Invited Paper in Proceedings of the 53rd Design Automation Conference (DAC), Austin, TX, June 2016. [Slides (pptx)] [Slides (pdf)] entitled "The Row Hammer Problem and Other Issues We May Face as Memory Becomes Denser"
"Genome Read In-Memory (GRIM) Filter: Fast Location Filtering in DNA Read Mapping with Emerging Memory Technologies"
20th Annual International Conference on Research in Computational Molecular Biology (RECOMB) Poster Session, Santa Monica, CA, April 2016. [Flash Talk Slides (pptx) (pdf)] at 6th RECOMB Satellite Workshop on Massively Parallel Sequencing (RECOMB-SEQ). "Reliability and Security Issues of DRAM and NAND Flash Scaling"
Memory Reliability Forum at HPCA, Barcelona, Spain, March 2016. Proceedings of the 22nd International Symposium on High-Performance Computer Architecture (HPCA), Barcelona, Spain, March 2016. "Low-Cost Inter-Linked Subarrays (LISA): Enabling Fast Inter-Subarray Data Movement in DRAM"
"ChargeCache: Reducing DRAM Latency by Exploiting Row Access Locality"
"A Case for Toggle-Aware Compression for GPU Systems"
Parallel Computing (PARCO), to appear in 2016. "Bounding and Reducing Memory Interference Delay in COTS-based Multi-Core Systems"
Journal of Real-Time Systems (RTS), to appear in 2016. "BLISS: Balancing Performance, Fairness and Complexity in Memory Access Scheduling"
IEEE Transactions on Parallel and Distributed Systems (TPDS), to appear in 2016. An earlier version as SAFARI Technical Report, TR-SAFARI-2015-004, Carnegie Mellon University, March 2015. "Mitigating the Memory Bottleneck With Approximate Load Value Prediction"
IEEE Design and Test (D&T), January/February 2016. "The 2014 MICRO Test of Time Award Winners: From 1978 to 1992"
IEEE Micro (IEEE MICRO), Vol. 36, No. 1, pages 60-61, January/February 2016. "DASH: Deadline-Aware High-Performance Memory Scheduler for Heterogeneous Systems with Hardware Accelerators"
ACM Transactions on Architecture and Code Optimization (TACO), Vol. 12, January 2016. Presented at the 11th HiPEAC Conference, Prague, Czech Republic, January 2016. "Simultaneous Multi-Layer Access: Improving 3D-Stacked Memory Bandwidth at Low Cost"
"RFVP: Rollback-Free Value Prediction with Safe to Approximate Loads"
"Rethinking Memory System Design (along with Interconnects)"
Keynote talk at 8th International Workshop on Network on Chip Architectures (NoCArc), Honolulu, Hawaii, December 2015. "Optimal Seed Solver: Optimizing Seed Selection in Read Mapping"
Bioinformatics, [published online, November 14], 2015. "The Application Slowdown Model: Quantifying and Controlling the Impact of Inter-Application Interference at Shared Caches and Main Memory"
"Gather-Scatter DRAM: In-DRAM Address Translation to Improve the Spatial Locality of Non-unit Strided Accesses"
"ThyNVM: Enabling Software-Transparent Crash Consistency in Persistent Memory Systems"
"Decoupled Direct Memory Access: Isolating CPU and IO Traffic by Leveraging a Dual-Data-Port DRAM"
"High-Performance and Lightweight Transaction Support in Flash-Based SSDs"
IEEE Transactions on Computers (TC), October 2015. One of the three papers nominated for the Best Paper Award by the Program Committee. "Read Disturb Errors in MLC NAND Flash Memory"
Technical talk at Flash Memory Summit 2015 (FMS), Santa Clara, CA, August 2015. High Throughput Sequencing Algorithms and Applications (HITSEQ) Poster Session, Dublin, Ireland, July 2015. "A Case for Core-Assisted Bottleneck Acceleration in GPUs: Enabling Flexible Data Compression with Assist Warps"
Proceedings of the 42nd International Symposium on Computer Architecture (ISCA), Portland, OR, June 2015. "Page Overlays: An Enhanced Virtual Memory Framework to Enable Fine-grained Memory Management"
"PIM-Enabled Instructions: A Low-Overhead, Locality-Aware Processing-in-Memory Architecture"
"A Scalable Processing-in-Memory Accelerator for Parallel Graph Processing"
Top Picks Honorable Mention by IEEE Micro. "A Large-Scale Study of Flash Memory Errors in the Field"
"Read Disturb Errors in MLC NAND Flash Memory: Characterization and Mitigation"
"Revisiting Memory Errors in Large-Scale Production Data Centers: Analysis and Modeling of New Trends from the Field"
"AVATAR: A Variable-Retention-Time (VRT) Aware Refresh for DRAM Systems"
"WARM: Improving NAND Flash Memory Lifetime with Write-hotness Aware Retention Management"
Proceedings of the 31st International Conference on Massive Storage Systems and Technologies (MSST), Santa Clara, CA, June 2015. "Amnesic Cache Management for Non-Volatile Memory"
IEEE Computer Architecture Letters (CAL), May 2015. "Fast Bulk Bitwise AND and OR in DRAM"
IEEE Computer Architecture Letters (CAL), April 2015. "Introducing the MICRO Test of Time Awards: Concept, Process, 2014 Winners, and the Future"
IEEE Micro (IEEE MICRO), Vol. 35, No. 2, pages 85-87, March/April 2015. "Ramulator: A Fast and Extensible DRAM Simulator"
IEEE Computer Architecture Letters (CAL), March 2015. "The Blacklisting Memory Scheduler: Balancing Performance, Fairness and Complexity"
SAFARI Technical Report, TR-SAFARI-2015-004, Carnegie Mellon University, March 2015. "SQUASH: Simple QoS-Aware High-Performance Memory Scheduler for Heterogeneous Systems with Hardware Accelerators"
SAFARI Technical Report, TR-SAFARI-2015-003, Carnegie Mellon University, March 2015. "A-DRM: Architecture-aware Distributed Resource Management of Virtualized Clusters"
Proceedings of the 11th ACM SIGPLAN/SIGOPS International Conference on Virtual Execution Environments (VEE), Istanbul, Turkey, March 2015. "Massively Parallel Mapping of Next Generation Sequence Reads Using GPUs"
Short Student Research Competition Paper at the 20th International Conference on Architectural Support for Programming Languages and Operating Systems (ASPLOS) Student Research Competition, Istanbul, Turkey, March 2015. "Energy-Efficient Data Compression for GPU Memory Systems"
First place in ACM Student Research Competition. "Main Memory Scaling: Challenges and Solution Directions"
Invited Book Chapter in More than Moore Technologies for Next Generation Computer Design, pp. 127-153, Springer, 2015. "Comparative Evaluation of FPGA and ASIC Implementations of Bufferless and Buffered Routing Algorithms for On-Chip Networks"
"Data Retention in MLC NAND Flash Memory: Characterization, Optimization and Recovery"
"Adaptive-Latency DRAM: Optimizing DRAM Timing for the Common-Case"
"Exploiting Compressed Block Size as an Indicator of Future Reuse"
"RFVP: Rollback-Free Value Prediction with Safe-to-Approximate Loads"
SAFARI Technical Report, TR-SAFARI-2015-002, Carnegie Mellon University, February 2015. "The Main Memory System: Challenges and Opportunities"
Invited Article in Communications of the Korean Institute of Information Scientists and Engineers (KIISE), 2015. "Shifted Hamming Distance: A Fast and Accurate SIMD-friendly Filter to Accelerate Alignment Verification in Read Mapping"
Bioinformatics, [published online, January 10], 2015. "Mitigating Prefetcher-Caused Pollution using Informed Caching Policies for Prefetched Blocks"
Presented at the 10th HiPEAC Conference, Amsterdam, Netherlands, January 2015. "Efficient Data Mapping and Buffering Techniques for Multi-Level Cell Phase-Change Memories"
"Managing GPU Concurrency in Heterogeneous Architectures"
"FIRM: Fair and High-Performance Memory Control for Persistent Memory Systems"
"Fast and Accurate Mapping of Complete Genomics Reads"
"The Blacklisting Memory Scheduler: Achieving High Performance and Fairness at Low Cost"
An extended version as SAFARI Technical Report, TR-SAFARI-2015-004, Carnegie Mellon University, March 2015. "Loose-Ordering Consistency for Persistent Memory"
Proceedings of the 32nd IEEE International Conference on Computer Design (ICCD), Seoul, South Korea, October 2014. An extended version as SAFARI Technical Report, TR-SAFARI-2014-001, Carnegie Mellon University, March 2014. "Error Analysis and Management for MLC NAND Flash Memory"
"Warp-Aware Trace Scheduling for GPUs"
"Rollback-Free Value Prediction with Approximate Loads"
"Shifted Hamming Distance (SHD): A Fast and Accurate SIMD-Friendly Filter for Local Alignment in Read Mapping"
Proceedings of the 41st International Symposium on Computer Architecture (ISCA), Minneapolis, MN, June 2014. One of the 7 papers of 2012-2017 selected as Top Picks in Hardware and Embedded Security for IEEE TCAD (link). "Characterizing Application Memory Error Vulnerability to Optimize Data Center Cost via Heterogeneous-Reliability Memory"
"Neighbor-Cell Assisted Error Correction for MLC NAND Flash Memories"
"The Efficacy of Error Mitigation Techniques for DRAM Retention Failures: A Comparative Experimental Study"
Invited Book Chapter in Computing Handbook, Third Edition: Computer Science and Software Engineering, CRC Press, April 2014. "Bounding Memory Interference Delay in COTS-based Multi-Core Systems"
SAFARI Technical Report, TR-SAFARI-2014-001, Carnegie Mellon University, March 2014. "Improving DRAM Performance by Parallelizing Refreshes with Accesses"
"Improving Cache Performance by Exploiting Read-Write Disparity"
SAFARI Technical Report, TR-SAFARI-2013-003, Carnegie Mellon University, December 2013. "Linearly Compressed Pages: A Low-Complexity, Low-Latency Main Memory Compression Framework"
"Program Interference in MLC NAND Flash Memory: Characterization, Modeling, and Mitigation"
"LightTx: A Lightweight Transactional Design in Flash-based SSDs to Support Flexible Transactions"
"Accelerating Critical Section Execution with Multicore Architectures"
Invited Book Chapter in Multicore Technology: Architecture, Reconfiguration, and Modeling, CRC Press, July 2013. "A Case for Efficient Hardware-Software Cooperative Management of Storage and Memory"
"An Experimental Study of Data Retention Behavior in Modern DRAM Devices: Implications for Retention Time Profiling Mechanisms"
"Utility-Based Acceleration of Multithreaded Applications on Asymmetric CMPs"
"Orchestrated Scheduling and Prefetching for GPGPUs"
"A Heterogeneous Multiple Network-on-Chip Design: An Application-Aware Approach"
"Error Analysis and Retention-Aware Error Management for NAND Flash Memory"
Intel Technology Journal (ITJ) Special Issue on Memory Resiliency, Vol. 17, No. 1, May 2013. "RowClone: Fast and Efficient In-DRAM Copy and Initialization of Bulk Data"
CMU Computer Science Technical Report, CMU-CS-13-108, Carnegie Mellon University, April 2013. "Techniques for Data Mapping and Buffering to Exploit Asymmetry in Multi-Level Cell (Phase Change) Memory"
SAFARI Technical Report, TR-SAFARI-2013-002, Carnegie Mellon University, May 2013. "Asymmetry-Aware Execution Placement on Manycore Chips"
"Evaluating STT-RAM as an Energy-Efficient Main Memory Alternative"
"Threshold Voltage Distribution in MLC NAND Flash Memory: Characterization, Analysis and Modeling"
"OWL: Cooperative Thread Array Aware Scheduling Techniques for Improving GPGPU Performance"
"Tiered-Latency DRAM: A Low Latency and Low Cost DRAM Architecture"
"MISE: Providing Performance Predictability and Improving Fairness in Shared Main Memory Systems"
"Accelerating Read Mapping with FastHASH"
"Message from the Micro-45 Program Chair"
"HiRD: A Low-Complexity, Energy-Efficient Hierarchical Ring Interconnect"
SAFARI Technical Report, TR-SAFARI-2012-004, Carnegie Mellon University, December 2012. "Evaluating Row Buffer Locality in Future Non-Volatile Main Memories"
SAFARI Technical Report, TR-SAFARI-2012-002, Carnegie Mellon University, December 2012. "HAT: Heterogeneous Adaptive Throttling for On-Chip Networks"
"Linearly Compressed Pages: A Main Memory Compression Framework with Low Complexity and Low Latency"
SAFARI Technical Report, TR-SAFARI-2012-005, Carnegie Mellon University, September 2012. "Row Buffer Locality Aware Caching Policies for Hybrid Memories"
"Flash Correct-and-Refresh: Retention-Aware Error Management for Increased Flash Memory Lifetime"
"A Case for Small Row Buffers in Non-Volatile Main Memories"
An extended version as SAFARI Technical Report, TR-SAFARI-2010-002, Carnegie Mellon University, December 2012. "Base-Delta-Immediate Compression: Practical Data Compression for On-Chip Caches"
"The Evicted-Address Filter: A Unified Mechanism to Address Both Cache Pollution and Thrashing"
"Application-to-Core Mapping Policies to Reduce Memory Interference in Multi-Core Systems"
"Application-aware Prefetch Prioritization in On-chip Networks"
Proceedings of the 21st International Conference on Parallel Architectures and Compilation Techniques (PACT) Poster Session, Minneapolis, MN, September 2012. Second place in ACM Student Research Competition. "On-Chip Networks from a Networking Perspective: Congestion and Scalability in Many-core Interconnects"
"RAIDR: Retention-Aware Intelligent DRAM Refresh"
"A Case for Exploiting Subarray-Level Parallelism (SALP) in DRAM"
"Staged Memory Scheduling: Achieving High Performance and Scalability in Heterogeneous Systems"
"Message from the MSPC 2012 Program Chair"
"A QoS-Enabled On-Die Interconnect Fabric for Kilo-Node Chips"
IEEE Micro, Special Issue: Micro's Top Picks from 2011 Computer Architecture Conferences (MICRO TOP PICKS), Vol. 32, No. 3, May/June 2012. "MinBD: Minimally-Buffered Deflection Routing for Energy-Efficient Interconnect"
"Fairness via Source Throttling: A Configurable and High-Performance Fairness Substrate for Multi-Core Memory Systems"
ACM Transactions on Computer Systems (TOCS), April 2012. A previous version as HPS Technical Report, TR-HPS-2012-001, February 2012. "Error Patterns in MLC NAND Flash Memory: Measurement, Characterization, and Analysis"
"Bottleneck Identification and Scheduling in Multithreaded Applications"
"Enabling Efficient and Scalable Hybrid Memories Using Fine-Granularity DRAM Cache Management"
IEEE Computer Architecture Letters (CAL), February 2012. "Some Ideas and Principles for Achieving Higher System Energy Efficiency"
Presented at the NSF Workshop on Cross-Layer Power Optimization and Management (NSF CPOM), Los Angeles, CA, February 2012. "FastHASH: A New GPU-friendly Algorithm for Fast and Comprehensive Next-generation Sequence Mapping"
"Reducing Memory Interference in Multicore Systems via Application-Aware Memory Channel Partitioning"
"Improving GPU Performance via Large Warps and Two-Level Warp Scheduling"
A previous version as HPS Technical Report, TR-HPS-2010-006, December 2010. IEEE Transactions on Computers (TC), Vol. 60, No. 10, pages 1406-1430, October 2011. "A High-Performance Hierarchical Ring On-Chip Interconnect with Low-Cost Routers"
SAFARI Technical Report, TR-SAFARI-2011-007, Carnegie Mellon University, September 2011. "Investigating the Viability of Bufferless NoCs in Modern Chip Multi-Processor Systems"
SAFARI Technical Report, TR-SAFARI-2011-004, Carnegie Mellon University, August 2011. "Kilo-NOC: A Heterogeneous Network-on-Chip Architecture for Scalability and Service Guarantees"
One of the 12 computer architecture papers of 2011 selected as Top Picks by IEEE Micro. "Prefetch-Aware Shared Resource Management for Multi-Core Systems"
"Memory Systems in the Many-Core Era: Challenges, Opportunities, and Solution Directions"
Joint Keynote Talk at ISMM (International Symposium on Memory Management) and MSPC (ACM Workshop on Memory System Performance and Correctness), San Jose, CA, June 2011. "Memory Power Management via Dynamic Voltage/Frequency Scaling"
"FIST: A Fast, Lightweight, FPGA-Friendly Packet Latency Estimator for NoC Modeling in Full-System Simulations"
"CHIPPER: A Low-Complexity Bufferless Deflection Router"
An extended version as SAFARI Technical Report, TR-SAFARI-2010-001, Carnegie Mellon University, December 2010. "Top Picks: Guest Editors' Introduction"
IEEE Micro, Special Issue: Micro's Top Picks from 2010 Computer Architecture Conferences (IEEE MICRO), Vol. 31, No. 1, pages 6-10, January/February 2011. "Data Marshaling for Multi-core Systems"
IEEE Micro, Special Issue: Micro's Top Picks from 2010 Computer Architecture Conferences (MICRO TOP PICKS), Vol. 31, No. 1, pages 56-64, January/February 2011. "Aergia: A Network-on-Chip Exploiting Packet Latency Slack"
IEEE Micro, Special Issue: Micro's Top Picks from 2010 Computer Architecture Conferences (MICRO TOP PICKS), Vol. 31, No. 1, pages 29-41, January/February 2011. IEEE Micro, Special Issue: Micro's Top Picks from 2010 Computer Architecture Conferences (MICRO TOP PICKS), Vol. 31, No. 1, pages 78-89, January/February 2011. "Thread Cluster Memory Scheduling: Exploiting Differences in Memory Access Behavior"
One of the 11 computer architecture papers of 2010 selected as Top Picks by IEEE Micro. "Next Generation On-Chip Networks: What Kind of Congestion Control Do We Need?" "Phase Change Memory Architecture and the Quest for Scalability"
Communications of the ACM (CACM), Research Highlight, Vol. 53, No. 7, pages 99-106, July 2010. "Aergia: Exploiting Packet Latency Slack in On-Chip Networks"
"Data Marshaling for Multi-core Architectures"
"Topology-aware Quality-of-Service Support in Highly Integrated Chip Multiprocessors"
"QuaLe: A Quantum-Leap Inspired Model for Non-Stationary Analysis of NoC Traffic in Multi-Processor Platforms"
Proceedings of the 4th ACM/IEEE International Symposium on Networks on Chip (NOCS), pages 241-248, Grenoble, France, May 2010. "Concurrent Autonomous Self-Test for Uncore Components in System-on-Chips"
"DRAM-Aware Last-Level Cache Writeback: Reducing Write-Caused Interference in Memory Systems"
HPS Technical Report, TR-HPS-2010-002, April 2010. "Asymmetry Everywhere (with Automatic Resource Management)"
CRA Workshop on Advancing Computer Architecture Research: Popular Parallel Programming (NSF ACAR), San Diego, CA, February 2010. "ATLAS: A Scalable and High-Performance Scheduling Algorithm for Multiple Memory Controllers"
Best paper session. One of the four papers nominated for the Best Paper Award by the Program Committee. "Phase Change Technology and the Future of Main Memory"
IEEE Micro, Special Issue: Micro's Top Picks from 2009 Computer Architecture Conferences (MICRO TOP PICKS), Vol. 30, No. 1, pages 60-70, January/February 2010. "Accelerating Critical Section Execution with Asymmetric Multi-Core Architectures"
IEEE Micro, Special Issue: Micro's Top Picks from 2009 Computer Architecture Conferences (MICRO TOP PICKS), Vol. 30, No. 1, pages 131-141, January/February 2010. "Application-Aware Prioritization Mechanisms for On-Chip Networks"
"Coordinated Control of Multiple Prefetchers in Multi-Core Systems"
"Preemptive Virtual Clock: A Flexible, Efficient, and Cost-effective QOS Scheme for Networks-on-Chip"
"Improving Memory Bank-Level Parallelism in the Presence of Prefetching"
"Operating System Scheduling for Efficient Online Self-Test in Robust Systems"
"Personalized copy number and segmental duplication maps using next-generation sequencing"
"Virtual Program Counter (VPC) Prediction: Very Low Cost Indirect Branch Prediction using Conditional Branch Prediction Hardware"
IEEE Transactions on Computers (TC), Vol. 58, No. 9, pages 1153-1170, September 2009. "A Flexible Software-Based Framework for Online Detection of Hardware Defects"
IEEE Transactions on Computers (TC), Vol. 58, No. 8, pages 1063-1079, August 2009. "A Case for Bufferless Routing in On-Chip Networks"
"Architecting Phase Change Memory as a Scalable DRAM Alternative"
One of the 13 computer architecture papers of 2009 selected as Top Picks by IEEE Micro. Selected as a CACM Research Highlight. "Flexible Reference Counting-Based Hardware Acceleration for Garbage Collection"
"Techniques for Bandwidth-Efficient Prefetching of Linked Data Structures in Hybrid Prefetching Systems"
Best paper session. One of the three papers nominated for the Best Paper Award by the Program Committee. "Express Cube Topologies for On-Chip Interconnects"
"Parallelism-Aware Batch Scheduling: Enabling High-Performance and Fair Memory Controllers"
IEEE Micro, Special Issue: Micro's Top Picks from 2008 Computer Architecture Conferences (MICRO TOP PICKS), Vol. 29, No. 1, pages 22-32, January/February 2009. "Online Design Bug Detection: RTL Analysis, Flexible Mechanisms, and Evaluation"
An extended version as HPS Technical Report, TR-HPS-2008-002, University of Texas at Austin, September 2008. "Distributed Order Scheduling and its Application to Multi-Core DRAM Controllers"
"Parallelism-Aware Batch Scheduling: Enhancing both Performance and Fairness of Shared DRAM Systems"
One of the 12 computer architecture papers of 2008 selected as Top Picks by IEEE Micro. "Self Optimizing Memory Controllers: A Reinforcement Learning Approach"
"Interaction of Many-core Computer Architecture and Operating Systems: Guest Editors' Introduction"
IEEE Micro Special Issue (IEEE MICRO), Vol. 28, No. 3, pages 2-5, May/June 2008. "Improving the Performance of Object-Oriented Languages with Dynamic Predication of Indirect Jumps"
"Performance-Aware Speculation Control using Wrong Path Usefulness Prediction"
"Stall-Time Fair Memory Access Scheduling for Chip Multiprocessors"
"Software-Based Online Detection of Hardware Defects: Mechanisms, Architectural Support, and Evaluation"
"Memory Performance Attacks: Denial of Memory Service in Multi-Core Systems"
"VPC Prediction: Reducing the Cost of Indirect Branches via Hardware-Based Dynamic Devirtualization"
An extended version including evaluation of object-oriented Java applications, as HPS Technical Report, TR-HPS-2007-002, University of Texas at Austin, March 2007. "Dynamic Predication of Indirect Jumps"
IEEE Computer Architecture Letters (CAL), Vol. 6(2), pages 25-28, May 2007. "Profile-assisted Compiler Support for Dynamic Predication in Diverge-Merge Processors"
"Feedback Directed Prefetching: Improving the Performance and Bandwidth-Efficiency of Hardware Prefetchers"
"Diverge-Merge Processor: Generalized and Energy-Efficient Dynamic Predication"
IEEE Micro, Special Issue: Micro's Top Picks from 2006 Computer Architecture Conferences (MICRO TOP PICKS), Vol. 27, No. 1, pages 94-104, January/February 2007. "Diverge-Merge Processor (DMP): Dynamic Predicated Execution of Complex Control-Flow Graphs Based on Frequently Executed Paths"
One of the 11 computer architecture papers of 2006 selected as Top Picks by IEEE Micro. An extended version as HPS Technical Report, TR-HPS-2006-008, University of Texas at Austin, September 2006. "Address-Value Delta (AVD) Prediction: A Hardware Technique for Efficiently Parallelizing Dependent Cache Misses"
IEEE Transactions on Computers (TC), Vol. 55, No. 12, pages 1491-1508, December 2006. Nominated for the ACM Doctoral Dissertation Award by the University of Texas at Austin. "A Case for MLP-Aware Cache Replacement"
"2D-Profiling: Detecting Input-Dependent Branches with a Single Input Data Set"
An extended version as HPS Technical Report, TR-HPS-2006-001, University of Texas at Austin, January 2006. "Efficient Runahead Execution: Power-Efficient Memory Latency Tolerance"
"Wish Branches: Enabling Adaptive and Aggressive Predicated Execution"
"An Analysis of the Performance Impact of Wrong-Path Memory References on Out-of-Order and Runahead Execution Processors"
IEEE Transactions on Computers (TC), Vol. 54, No. 12, pages 1556-1571, December 2005. "Address-Value Delta (AVD) Prediction: Increasing the Effectiveness of Runahead Execution by Exploiting Regular Memory Allocation Patterns"
An extended version as HPS Technical Report, TR-HPS-2006-004, University of Texas at Austin, April 2006. "Wish Branches: Combining Conditional Branching and Predication for Adaptive Predicated Execution"
One of the 13 computer architecture papers of 2005 selected as Top Picks by IEEE Micro. "Using the First-Level Caches as Filters to Reduce the Pollution Caused by Speculative Memory References"
International Journal of Parallel Programming (IJPP), Vol. 33, No. 5, pages 529-559, October 2005. "Techniques for Efficient Processing in Runahead Execution Engines"
"Microarchitecture-Based Introspection: A Technique for Transient-Fault Tolerance in Microprocessors"
"On Reusing the Results of Pre-Executed Instructions in a Runahead Execution Processor"
IEEE Computer Architecture Letters (CAL), Vol. 4, January 2005. "Wrong Path Events: Exploiting Unusual and Illegal Program Behavior for Early Misprediction Detection and Recovery"
An extended version as HPS Technical Report, TR-HPS-2004-002, University of Texas at Austin, June 2004. "Cache Filtering Techniques to Reduce the Negative Impact of Useless Speculative Memory References on Processor Performance"
"Understanding the Effects of Wrong-Path Memory References on Processor Performance"
An extended version as HPS Technical Report, TR-HPS-2005-001, University of Texas at Austin, January 2005. "Runahead Execution: An Effective Alternative to Large Instruction Windows"
IEEE Micro, Special Issue: Micro's Top Picks from Microarchitecture Conferences (MICRO TOP PICKS), Vol. 23, No. 6, pages 20-25, November/December 2003. "Runahead Execution: An Alternative to Very Large Instruction Windows for Out-of-order Processors"
One of the 15 computer architecture papers of 2003 selected as Top Picks by IEEE Micro. HPS Technical Report, TR-HPS-2010-007, December 2010. "An Asymmetric Multi-core Architecture for Accelerating Critical Sections"
HPS Technical Report, TR-HPS-2008-003, September 2008. HPS Technical Report, TR-HPS-2008-002, September 2008. HPS Technical Report, TR-HPS-2007-002, March 2007. Microsoft Research Technical Report, MSR-TR-2007-15, February 2007. "A Performance-Aware Speculation Control Technique Using Wrong Path Usefulness Prediction"
HPS Technical Report, TR-HPS-2006-010, December 2006. HPS Technical Report, TR-HPS-2006-008, September 2006. HPS Technical Report, TR-HPS-2006-006, May 2006. "Compiler-Assisted Dynamic Predicated Execution of Complex Control-Flow Structures"
HPS Technical Report, TR-HPS-2006-005, April 2006. HPS Technical Report, TR-HPS-2006-004, April 2006. HPS Technical Report, TR-HPS-2006-003, University of Texas at Austin, February 2006. HPS Technical Report, TR-HPS-2006-001, University of Texas at Austin, January 2006. "Wish Branch: A New Control Flow Instruction Combining Conditional Branching and Predicated Execution"
HPS Technical Report, TR-HPS-2005-002, University of Texas at Austin, February 2005. HPS Technical Report, TR-HPS-2005-001, University of Texas at Austin, January 2005. HPS Technical Report, TR-HPS-2004-004, University of Texas at Austin, December 2004. "Wrong Path Events: Exploiting Illegal and Unusual Program Behavior for Early Misprediction Recovery"
HPS Technical Report, TR-HPS-2004-002, University of Texas at Austin, June 2004. "The Design of a 7-stage Pipelined 143 MHz Microprocessor Implementing a Subset of the x86 ISA"
EE 382N (Microarchitecture) Project Report, University of Texas at Austin, May 2002. "An Overview of Image Watermarking Algorithms"
EE 371R (Digital Image and Video Processing) Project Report, University of Texas at Austin, December 2001. "Effectiveness of TCP for Video Transport"
CS 384V (Multimedia Systems) Project Report, University of Texas at Austin, November 2001. EE 382N (Superscalar Microprocessor Architecture) Slides, University of Texas at Austin, November 2001. "Design of a Buffer Management Scheme for Video Servers"
CS 384V (Multimedia Systems) Project Report, University of Texas at Austin, October 2001. "Memory Dependence Prediction and Access Ordering for Memory Disambiguation and Renaming"
EE 382N (Superscalar Microprocessor Architecture) Literature Survey, University of Texas at Austin, October 2001. "A Global Predicate Detector for Distributed Computation"
EE 382N (Distributed Systems) Project Report, Winner of Best Project Award, University of Texas at Austin, December 2000. "Effects of the Type of Loud Background Music on Speed of Processing"
PSYCH 341 (Cognitive Psychology Laboratory) Project Report, University of Michigan, Ann Arbor, August 2000. "A Low-Power Low-Cost 16-Bit RISC Microcontroller for Security Systems"
"A Grammatical Sketch of Even"
LING 112 (Languages of the World) Project Report, University of Michigan, Ann Arbor, December 1999.